B Rao. Seronegative Central Nervous System Toxoplasmosis in HIV/AIDS. The Internet Journal of Internal Medicine. 2004 Volume 5 Number 2. Immunodeficiency Virus (HIV) infection in 1989. He was apparently doing well on anti retro viral therapy until recently when he began to experience symptoms of ataxia and weakness. 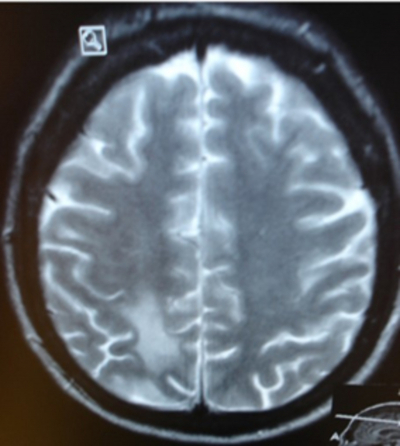 Magnetic Resonance Imaging (MRI) of the brain revealed several ring enhancing lesions. A broad differential diagnoses including Tuberculosis, Lymphoma, Cryptococcosis, Toxoplasmosis, and possible metastasis were considered. The patient was empirically treated for Toxoplasmosis even though the serology was negative for the same. Further invasive diagnostic testing was withheld awaiting results of a repeat MRI two weeks into the treatment. There was near complete resolution of these lesions within a fortnight of institution of anti microbial therapy. This article likes to emphasize on the fact that a trial of anti Toxoplasma therapy is warranted prior to further invasive diagnostic testing even in the immediate absence of IgM antibodies to Toxoplasma gondii. The causes for multiple ring enhancing cerebral lesions (MRECL) in patients with Human Immunodeficiency Virus (HIV) infection/ Acquired Immune Deficiency Syndrome (AIDS) range from resolving hematomas and infarcts to infections and malignancies [5, 6]. A clinical approach to the diagnosis and management of these patients emphasizes on a trial of antimicrobials based on serological evidence of infection prior to further invasive diagnostic testing to avoid potential complications and discomfort related to brain biopsy[1, 2]. However, IgM antibodies to Toxoplasma are often absent in patients with HIV/AIDS[3, 7]. In the Seronegative cases the dilemma facing the physician is whether to biopsy the lesion for an accurate diagnosis or empirically treat the patient for Toxoplasmosis. We discuss the management of a patient with HIV/AIDS with MRECL who was Seronegative for Toxoplasmosis that resolved with treatment with Pyrimethamine and Sulfadiazine. Our patient was a 38 year old white male who was known to have HIV since 1989. He had been doing reasonably well on anti retro viral therapy given the duration of his illness. His last Cluster of Differentiation 4+ (CD4+) count done about a month ago was 225/L and his viral load was 51,000 copies/mL. He initially presented to his primary care doctor with complaints of blurry vision, unsteady gait and frequent falls in the recent past. 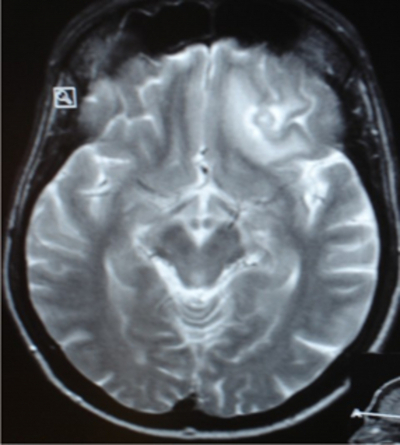 Computerized Tomography (CT) scan of his head done by his doctor revealed diffuse white matter disease which dictated the need for further diagnostic testing. Serum IgG for Toxoplasma was found to be negative a few years ago. The patient was admitted to the hospital for further work up and management of his problem. On examination, the patient was afebrile and had essentially stable vital signs. There were no cardiac murmurs and his chest was clear to auscultation. He had an unsteady gait, a positive Romberg's sign, decreased plantar reflex on the right and decreased visual acuity in both eyes. MRI of his head demonstrated MRECL scattered in the white matter of the left frontal lobe, right occipital lobe and left cerebellar hemisphere [Figures 1 & 2]. Serum IgM for Toxoplasma was found to be negative. After contemplation, the patient was started on presumptive treatment for cerebral Toxoplasmosis with Pyrimethamine 100 mg Per Oral (PO) q daily and Sulfadiazine 1000 mg POq 6 hrs. Serum tests for Cryptococcal and Histoplasma antigens; blood cultures and Rapid Plasma Reagin (RPR) were negative. 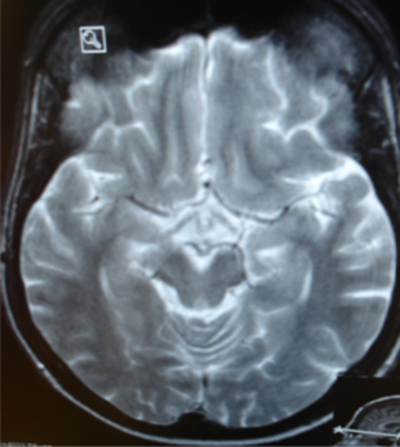 Figures 1 & 2: MRI of the Brain demonstrating ring enhancing lesions visible in the left Frontal lobe, left Cerebellar hemisphere and right Occipital lobe. The patient was also started on Abacavir, Atazanavir and Lamivudine for his HIV infection and was given Folinic Acid as a 'rescue' medication. He was also started on Levetiracetam after an Electro Encephalogram (EEG) was obtained. The option of Invasive diagnostic testing such as stereotactic biopsy was reserved for failure of resolution of these lesions after a trial of two weeks of therapy with the above named drugs. The patient returned to the hospital in two weeks. His gait and visual disturbances had begun to resolve. A repeat MRI of the head showed 50%-80% resolution of the Occipital and Cerebellar lesions and near complete resolution of the Frontal lobe lesions [Figures 3 & 4]. Figures 3 & 4: A repeat MRI done two weeks after institution of antimicrobial therapy demonstrates near complete resolution of these lesions. 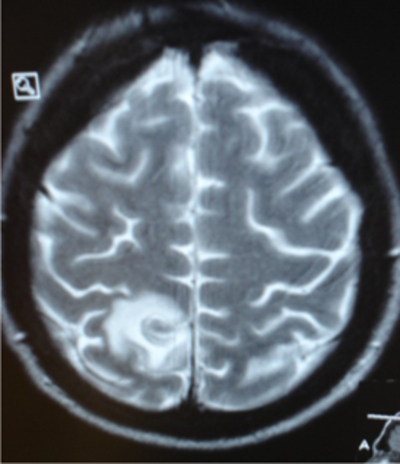 Cerebral Toxoplasmosis is a common cause of MRECL in a patient with HIV/AIDS. Serological tests for Toxoplasma include detection of IgG and IgM antibodies but serum tests for IgM antibodies are generally negative in patients with AIDS [ 3, 7, 9] and had been as low as 0 – 9 % in various studies; amongst patients who showed a response to anti Toxoplasma therapy. [9, 10] Several commercial kits for Toxoplasma serologic testing are available. However, the sensitivity and specificity of these kits may vary widely from one commercial brand to another. [3, 11] The kit used in our patient was a commercial ELISA kit with a sensitivity of 90% and specificity of 100 % to detect anti Toxoplasma IgM but these numbers have no bearing in patients with HIV/AIDS as their immune response in blunted and they fail to produce the required IgM. Polymerase Chain Reaction of the cerebrospinal fluid for Toxoplasma DNA has been suggested as an additional diagnostic approach by some  but a lumbar puncture is often not feasible in a patient with intracerebral space occupying lesions. Toxoplasmosis should be one of the top differentials kept in mind for a MRECL in the immunocompromised host. The decision to initiate or withhold a therapeutic trial of antimicrobials should not be based on the results of antibody testing alone. I thank Dr.Pratap Chand for helping me prepare this article and Dr.Jeremy Jones in guiding me through the process. 11. Decoster A, Lambert N, Germaneau C, Masson C. Toxoplasmosis serodiagnosis: comparison of Access Toxo IgM II assay compared to Axsym Toxo IgM and Vidas Toxo IgM assays. Ann Biol Clin (Paris). 2000 Nov-Dec;58(6):721-7.